Getting to the highest in South hemisphere and the most isolated country is quite difficult but totally worth. Bolivia is the country that has the world’s coldest and hottest places, most magnificent nature and 60% of indigenous tribes of South America. Full of surprises and great experiences – this is Bolivia. There are several ways how you can get to this wonderful country. The first and the most comfortable is of course by plane. There are at least 3 international airports that are located in La-Paz, Cochabamba and Santa-Cruz. There are weekly flights to La-Paz that go from Buenos-Aires, Cordova and other Latin America’s cities. Many of this flights stop in Santa-Cruz, Cochabamba and Sucre. The most famous via company is LABPass that works inside the country. 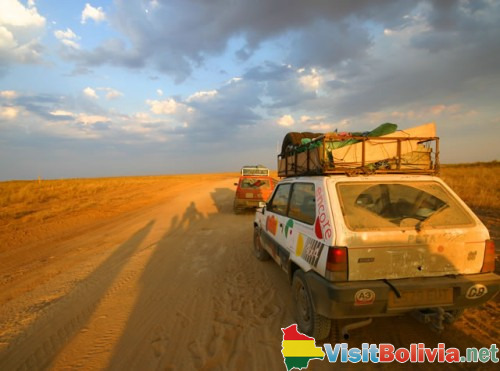 Once you get to Bolivia there are three main ways of travelling which are: by plane, by bus or by car. Plane is probably the best choice. According that this is the most isolated country there aren’t big alternative for newcomers. As an example imagine 49 000 km of roads and only 2 000 km is paved. Anyway, internal flights are very cheap (40$-100$). Though the prices are low prepare yourself for probable delays and try not to miss your flight because you might wait for another for about 27 hours. Travelling by train will save your time and money. Trains have destinations outside and inside the country, though they might not look as luxurious as the European ones, Bolivian trains have hospitable controllers that will always please you with a cup of Indian tea. Another rather comfortable way of travelling is by bus. This type is absolutely charming, you will have a chance to save quite a sum of money, glance at beautiful Bolivian landscapes and have a unique chance to travel with real Bolivians who might not speak much English but will friendly listen and help you how they can. One more extreme type is to travel by car. As the sum of the paved roads is very small be ready to help your car if it gets stuck. In addition, there are almost no road signs so the best tip is either to take a very good map or ask some local to guide you. One more thing is to buy or rent a 4X4, you will definitely need it, especially if it is a rainy season which usually lasts from fall till spring. One of the most extreme ways is to travel by taxi. Travelling by taxi is sometimes necessary because there are some cities that cannot be reached by bus or train. Taxi is considered to be a rather dangerous way especially if you are a woman and travelling alone. The most spiritual way of travelling is on the horseback.These tours are usually short distanced and should be guided by a Bolivian. Alike other tours they will let you feel breathtaking moments and explore Bolivian culture. The last and most fascinating way is on foot. If you dare to travel the highest country in South America make sure you are in a good physical shape and have endless sense of adventure. The most extreme tour is called a “Death Road” which goes from La Cumbre to Carioco. The mountainbike tour is 64 km. Prepare to start in severe la-Cumbre and end in tropical Carioco.